To Margaret Humphreys, social worker, author, founder of the Child Migrants Trust. From Kate Foale. 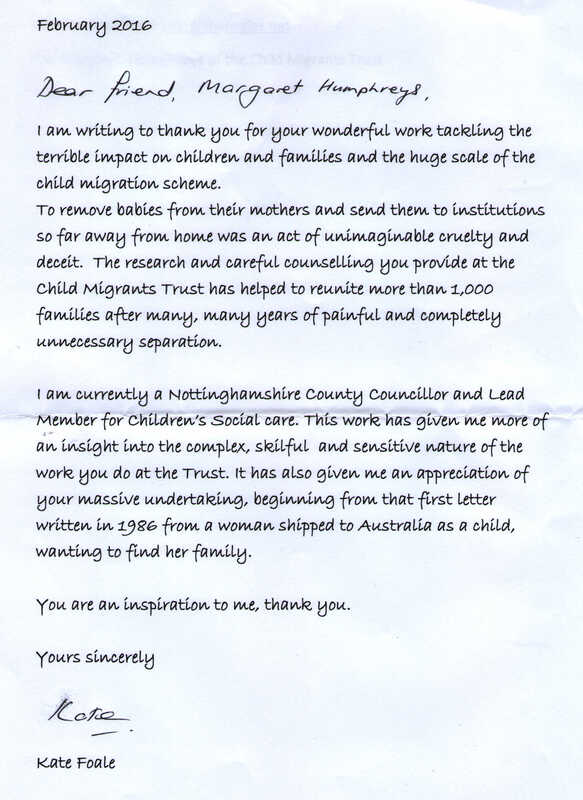 I am writing to thank you for your wonderful work tackling the terrible impact on children and families and the huge scale of the child migration scheme. To remove babies from their mothers and send them to institutions so far away from home was an act of unimaginable cruelty and deceit. The research and careful counselling you provide at the Child Migrants Trust has helped to reunite more than 1,000 families after many, many years of painful and completely unnecessary separation. I am currently a Nottinghamshire county councillor and Lead Member for Children’s Social Care. This work has given me more of an insight into the complex, skilful, and sensitive nature of the work you do at the Trust. It has also given me an appreciation of your massive undertaking, beginning from that first letter written in 1986 from a woman shipped to Australia as a child, wanting to find her family. You are an inspiration to me, thank you. social worker, author, founder of the Child Migrants Trust. Born 1944. More information about Margaret Humphreys.